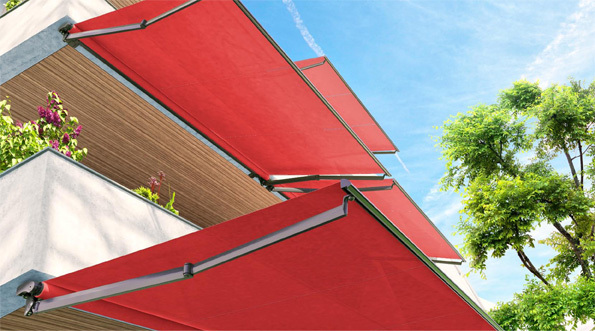 Our awnings are available in manual crank operation or by a simple remote control. Motorized awnings are very popular for both home and business. A motorized upgrade allows you to quickly extend or retract your awning with minimal effort. See for yourself at our showrooms. Take a look below at the options and features available on each model. Don't forget to check out all the latest promotions, on out specials page. Ask us about adding motorization to this model. QPC - "Quick Pitch Control"
All features of the Larissa system with a cassette hood. When retracted, the fabric is completely enclosed inside the protective cassette cover. Protects the fabric from the harsh effects of the sun, rain and snow. Basic Folding arm awning with a square back mounting bar for residential and commercial applications. *There are limitations to larger sizes with pitch control and valance upgrades. 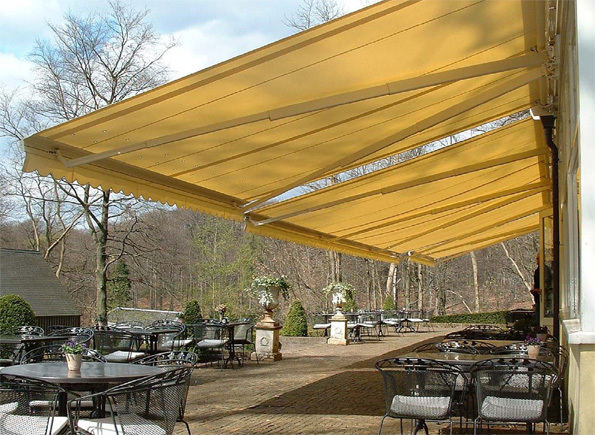 Maximize your outdoor living enjoyment by installing a Sun Stopper™ Awning. These awnings gracefully blend in with the exterior beauty of any home and offer protection from the sun and rain while reducing your energy costs. These custom designed, handcrafted awnings will increase the value of any home. From one-touch control to fully automated systems, Sun Stopper and Somfy have the motors and controls to suit your needs. Motors allow you to quickly extend or retract the awning with minimal effort. Whether you want added living space, protection from the elements or a way to reduce energy costs, Sun Stopper Awnings are the ultimate shading system available!